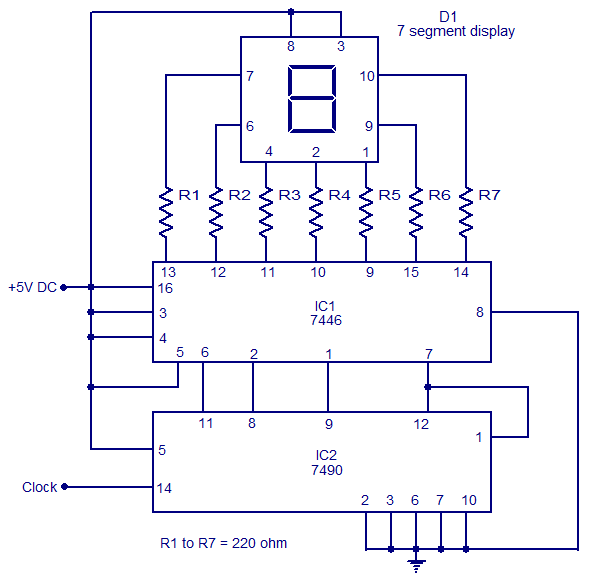 The circuit shows simple 0 to 9 display that can be employed in a lot of applications. This circuit is based on 7 segment display asynchronous decade counter 7490(IC2), and a seven segment decoder/driver IC 7446 (IC1). Circuit Diagram of 7 Segment Display. Seven segment display consists of 7 LEDs labelled ‘a’ through ‘g’. By forward biasing different LEDs, we can display the digits 0 through 9. Seven segment displays are of two types, common cathode and common anode. All the seven LEDs are tied together, while in common cathode type all cathodes are tied together. The seven segment display used here is a common anode type .Resistor R1 to R7 are current limiting resistors. IC 7446 is a decoder/driver IC used to drive the seven segment display. 0 Response to "Simple 0 to 9 Display Circuit Using 7 Segment Display by IC 7446"